I've slowly embarked on a quest to try new-to-me restaurants in my adopted hometown. Thus far, I've dined at Fogo de Chao (which granted is a national chain, but a favorite in Minneapolis nonetheless), Bourbon Butcher, Harry's and the recently added, French Meadow Bakery & Café. A schedule misinterpretation on my part lead us to a corner booth at this charming café on a chilly Saturday morning in St. Paul. It was a happy mistake. 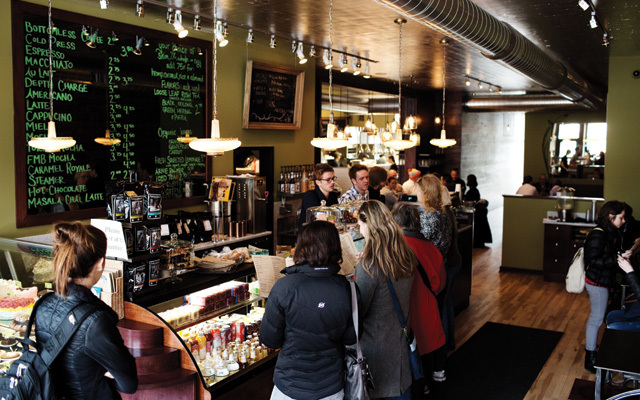 Beginning in 1985 as the first certified organic bread bakery in the nation, French Meadow soon expanded as a café to keep up with their loyal customers' demands. Additional locations were added, and though we weren't at the flagship store, we were treated with its trademark care and hospitality. When members of your family are Celiac, Diabetic and gluten-tolerant, dining out can be a bit of a challenge. And well, we challenged French Meadow to breakfast. Fresh-squeezed apple juice for the kids. Then, entrees with locally-sourced, farm-grown ingredients that fulfilled so much more than our appetites. Beyond breakfast, French Meadow boasts a full menu of burgers, organic wines, local beers and signature craft cocktails. The vibe is refreshingly simple yet gracefully refined, and I admired the Old World fixtures of the 100-year-old building that houses the restaurant. The tin ceiling, brick walls, gorgeous hardwood flooring and Edison light bulbs pleased the eye as much as my meal appeased my taste buds. This place championed organics before the concept existed, and now it's a friendly oasis that I'll rely on should I find myself near one in the future. Locations: 2610 Lyndale Ave. S in Minneapolis; 1662 Grand Avenue in St. Paul; U of M Recreation & Wellness Center; and Airports in Minneapolis/St. Paul, Atlanta, Milwaukee & Salt Lake City.